Compelling on many levels, Tomas Fujiwara rises above some fearsome competition in his performances with his band, Tomas Fujiwara And The Hook Up. How subtly the drummer applies his ornamentation to emphasise the conversational quality of his music, while his elusive pedalling gives the murmuring counterpoint a haloed quality. Mr. Fujiwara takes the odd rhymes and metres of the compositions and proceeds to point up its rhythmic elegance with great glee. When it reappears upside-down you’re made aware of it but the effect is always indefinable. On “The Comb”, it’s as if the music is folding in on itself, as Mr. Fujiwara withdraws more and more, to intoxicatingly rapt effect. On “The Hook Up” we have an example of the drummer’s instinctive pacing, the energy deriving from the phrasing rather than sheer speed. Listen out for a highly effective passage somewhere in the middle of the track where he points up the bass-line with a delirious staccato. The pedal points towards the end of this excerpt energise the music enormously. It is on this track that the drummer also revels in the glistening elegance of the latter movement, an effect emphasised by his ravishing ornamentation, before a return to the opening statements of the chart. This is a glorious example of how Tomas Fujiwara and his music have become strange bedfellows. They simply have to be – the drummer invented them and his playing here is compelling on various levels. To start with, there is a sense of sharing the sheer physical thrill of the visceral energy of the multi-instrumentalist writing. This is evident from the manner in which the colours and textures of the various instruments fold, one into the other with such brilliance and singularity. Then there is breathless beauty of Mr. Fujiwara’s bandmates playing with time enough for textures to melt from one instrument to the other. And as you will probably be reading this before listening to the record, try and imagine Mary Halvorson’s guitar and Michael Formanek’s bass locked in an interminable dance of the double helix; or the results of flexing of the improvisational muscles by reeds and woodwinds player, Brian Settles and trumpeter Jonathan Finlayson. And how Tomas Fujiwara can dance in all the relevant spaces with subtle dynamics, exquisite voicings, articulation and judicious ornamentation. All of this speaks to the magic of the music and the irresistible manner in which Tomas Fujiwara draws you into his own world with whispered intimacy and beckoning ornamentation. Are there any caveats? Some may find the basic pulse of the percussion-driven music perhaps too slow. To me it works precisely because Mr. Fujiwara teases so much out of each line. They have a breathtaking Elvin Jones-like intensity that draws you ineluctably in without any of the New Yorkers’ wilfulness. This is especially true of the mysterious track, “The Comb”. Moreover, you can be in no doubt of the thought that has gone into this enterprise, from Mr. Fujiwara’s uttering the first pulse on the first chart of the album. This goes on from one chart to the next. 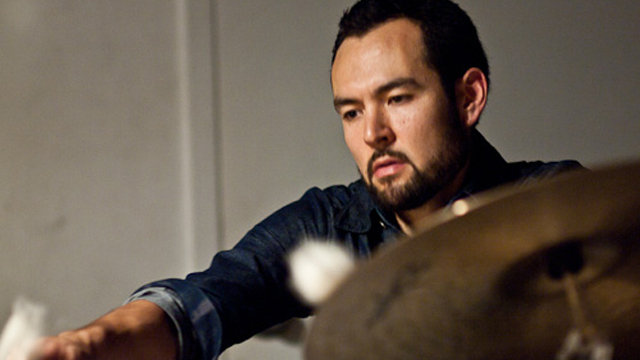 At every turn Tomas Fujiwara harnesses the possibilities of the drums in the service of his music. The result is a clear labour of love, and one in which he shines new light on his music with mesmerising effect. Cherish this one.